The cloud refers to a network of servers that run on the Internet. These servers provide various functions, such as offering an online service or storing and accessing data. Many cloud services, such as Dropbox, Evernote, Google Drive, and Office 365, can be accessed through a web browser, like Firefox or Chrome, while some offer mobile apps. As long as you have an Internet connection, you can access your information on any device. Other benefits of the cloud include ample storage space, flexibility, document control, and automatic software updates. Pay-As-You-Go. Cloud environments have unlimited storage, and you can use this storage on an as-needed basis. You only pay for what you use. Reduce Capital Expenses. By using the cloud, you can reduce spending on such capital expenses as equipment and software. No License Fees. If you’re using a cloud service like Google Docs, for example, you don’t have to worry about buying licenses or software; Google has you covered. Ultimately, the cloud offers significant cost savings because it’s a strategic investment that pays off in the long run. Downtime can cost your business thousands of dollars. The cloud offers disaster recovery, so your IT infrastructure is protected during system crashes. Less downtime provides your business with increased productivity and efficiency. Additionally, your costs can reduce over time, as you won’t need to invest in hardware or maintenance. Think of all those cost savings! If you are thinking about moving your business to the cloud, consider having an in-depth review of your business objectives and current infrastructure done. Contact us today for a free cloud assessment. Bonus! 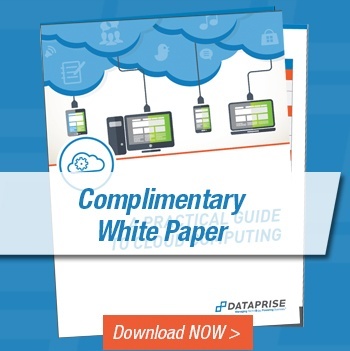 Learn more about the cloud by downloading our complimentary white paper.